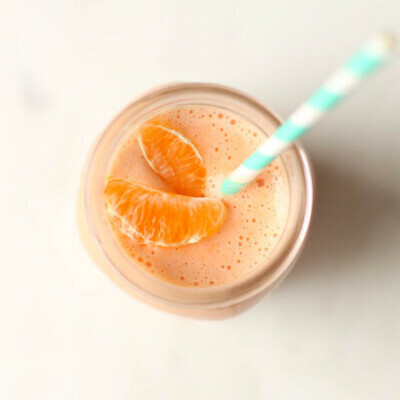 Sweet potato, clementine, carrot, and banana create the base of this easy, heathy smoothie that is reminiscent of the old orange sherbet push-up pops. Yum! *The smoothie texture is best if these ingredients are frozen beforehand in a freezer smoothie pack. If you don’t have time to freeze them, then add a 1/2 cup of crushed ice or more to achieve desired consistency. 1. Start by adding 1/2 cup almond milk and 1/2 cup orange juice to a high-powered blender. Then, add all the other ingredients. 2. Blend until smooth. You may need to stop and stir/shake the blender or add up to 1/2 cup more of almond milk, as needed, to make sure it gets smooth. 3. To Blend: Start by adding 1/2 cup almond milk, 1/2 cup orange juice, and the yogurt into a high-powered blender first. Break up the ingredients in the bag by hitting it on the counter or crunching it with your hands. Dump the ingredients from the bag in and follow blending instructions above.